This theme baby shower is used more frequently during late spring and summer months. It can be both for a boy and a girl. A great outdoor shower party! 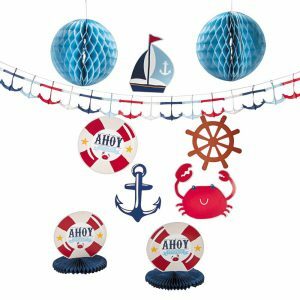 So here are few nautical theme baby shower decorations and ideas to hopefully wow your guests at your party. 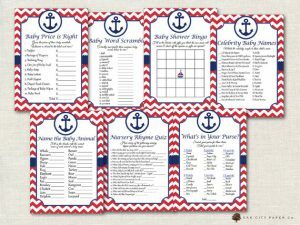 When you make a decision on what sort of party invitation you would like to send there are several one of a kind ways to work with for this nautical theme. You can buy online or you can make your own. How about making a treasure map card or, card shaped as a sailboat? Buy lovely ornaments which you can use your hot glue gun and stick on the invitation card. This will surely impress your guests! Come and celebrate the joy! Mommy and Baby will surely enjoy! But don’t forget to come on the hour! Click on the pictures to see if you can use these items to get that perfect nautical look as above! Or find a list of nautical items here. Fix the space by including different shades like deep blue and bright white together or try out other hues of blue/pink. Some great items you can implement for decorations include nettings, sailor man caps, ropes, paddles, seashells, anchors, a captain’s steering wheel, starfish, round life preservers, lighthouses and more. 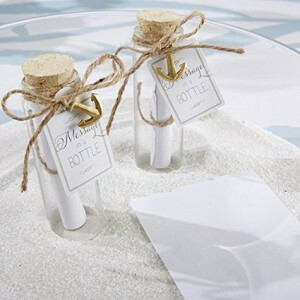 Putting miniature sailboats or even messages in a bottle are also great suggestions which will complement the actual theme. Have each guest write a message to the parents (such as wishes or parenting tips) and put in the message bottle. You can locate this on a small table at the entrance; so instead of a sign in book you can have these messages. Complementing table cloth in white or navy with cups, plates, napkins. 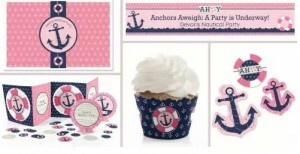 Here are some suggestions for boy and girl nautical theme baby shower supplies. Lighthouse Tea Light HolderAnother easier centerpiece would be fill sand in a large vase and place pillar candle in the middle. You can add sea shells and ribbon for additional decoration. Place the centerpiece on a square or round mirror to give a larger effect. Have an interesting party favor, something like mini sailboat candles. They’re quite functional given that they work extremely well as decoration and as take home gifts, which in turn saves you a little bit more money and time. It’s a wise decision to stop by a craft store, or browse for one on the web, to start certain creativity and reveal those talents in motion. On a budget? Consider making cookies created in forms of lighthouse, anchor or a boat. 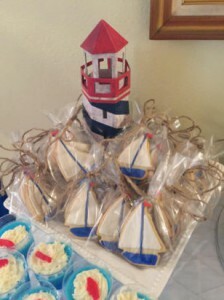 Here are a list of nautical baby shower cookie cutters; you can have sea shells, whales, crabs, anchors, sail boats, lighthouses, etc…This is great decor on the buffet table also. You might quite possibly send your invitees home along with a bag of goodies as a party favor. 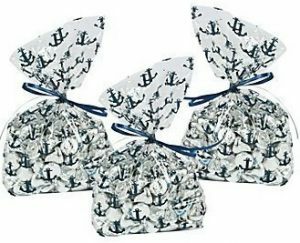 Package them in a nautical cellophane party bag with a custom-made label and then combine it with a ribbon or rope. 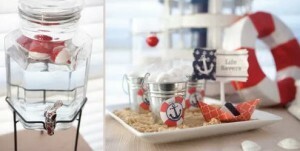 I love these nautical theme favor boxes, you can put candies or maybe even a mini scented candles. Continuing with homemade baby shower favors, another great idea for a favor are mini Chips Ahoy cookies! That’s right they are already individually packaged. To spruce it a bit you can place them into plastic favor bags with and attach them with rope or navy/striped ribbon. You can also add a tag with a saying such as “Thank You” or “Terry’s Baby Shower“. For even more luxurious party favors, you possibly can give out crystal sailboats or any other crystal favors. Of course, you might serve up just about any sea food. Crab or tuna salad offered on biscuits are a great appetizer. A few other food suggestions are: Crab cakes, shrimp cocktail, seafood rolls. For the buffet table, commonly the punch bowl is the focal point. Simply include some blue food drops, and maybe also put a few little floating plastic species of fish. My final tip would probably be to cut-out the food items (like sandwiches) into different nautical. You can use the cookie cutters above. And as for the cake, I like to have individual cupcakes for everyone with cute nautical cupcake picks and these nautical cupcake liners. But you can surely make one big fondant cake for everyone to enjoy! nautical cupcake picksAnother idea for the snack buffet would be popcorn in these little sailor popcorn boxes! sailor popcorn boxesIn the event that the guests question you exactly what to offer for a gift, be prepared with a list of baby shower items the mommy to be might need. 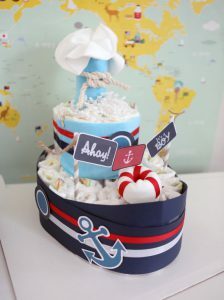 Lastly, nautical themed baby showers happen to be simple and with a very little creative imagination you will be able to organize the greatest shower. 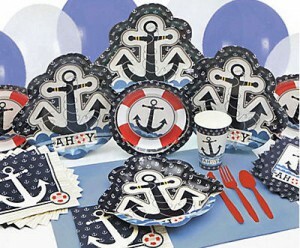 I hope you enjoyed the nautical theme baby shower decorations and ideas! Ahoy! This entry was posted in Theme and tagged Ideas, Themes, Unisex. Hi Terry, I love your website! This is exactly what I need to plan my sister’s baby shower. I like how detailed you are so you have included every little thing in your post. It will help tremendously people who are busy. To be honest my baby shower was not great at all. My girls were very kind and willing to do it for me but they were so busy at work and having this post would have helped them a lot. Thank You Lena for the kind words. I’m sure your baby shower was still great and memorable. I’m glad that I can help in any way. I like your website very much. It is very eye-catching. 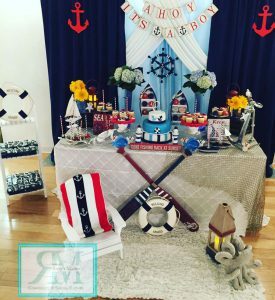 A nautical baby shower theme is very interesting and unique for both genders. I found your website very helpful on where to find supplies. I like the ideas for the centerpiece with the tea light holder. 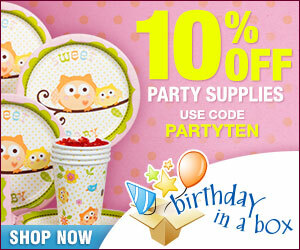 You mention every single detail to give a perfect baby shower party. Love the ideas! Hi Halide, thank you so much for your kind words. I’m glad you found something that might help you with your baby shower. I have to admit that nautical theme is one of my favorite for the summer season. As someone who loves throwing baby showers, I always seem to end up with the same theme and decorations. 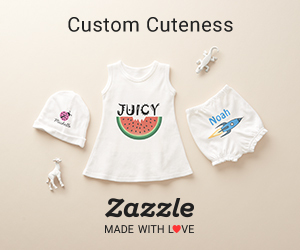 You have many great ideas here…I will definitely bookmark and come back to this site next time a family member or friend is having a baby shower. Love the props for the photo booth! Thank you for your comments. Glad you liked the ideas ! Thank you for this post! 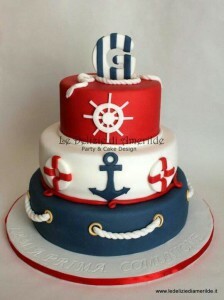 I simply love the nautical theme! Although I would never think of this theme for a baby shower, very creative. Did you have a baby shower yourself? And what theme was it? I do not have any children yet, but I would go for one of your outdoor or fairy tales themes. Planning my friend’s baby shower….Thanks for the inspo! Keep up the good work and the creative ideas! Hi Rosy, glad you stopped by. 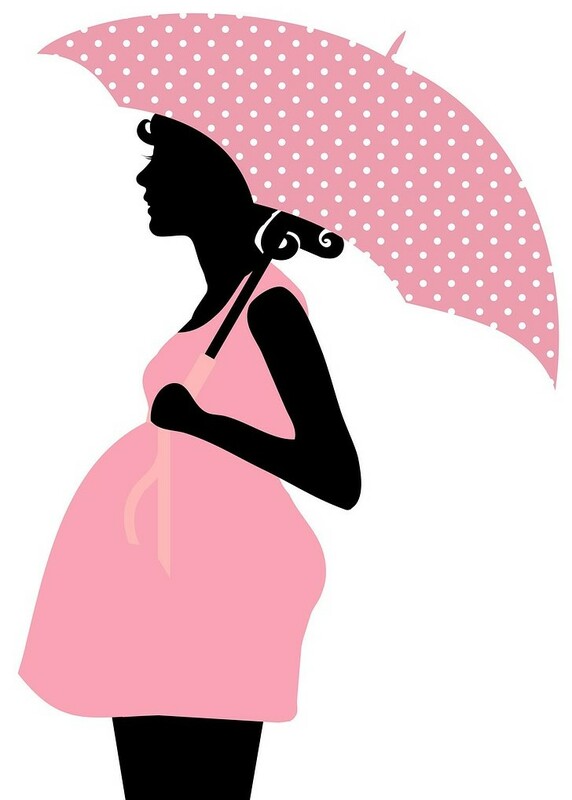 There are so many themes for baby showers out there…I have list many here. So I hope it can give you some inspiration for your friend’s shower. Yes, I had a surprise baby shower. My little niece picked ‘Fisher Price‘ as the theme:) I had such a great time. Hi there, I love love love your idea for a nautical theme! It is just so bright and jolly! And it works just as well for a unisex party. 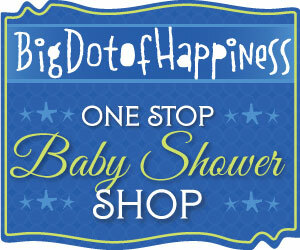 Planning a baby shower is no easy feat with soooo many things to consider! But you have certainly covered it all with this comprehensive post. Thanks for the help! Thank you Kris for stopping by. Glad to be of some help! Good luck with your baby shower planning!